According to The Washington Post, Barack Obama’s campaign has signed on with a few designers to release his own line of merchandise to be sold online at his website. 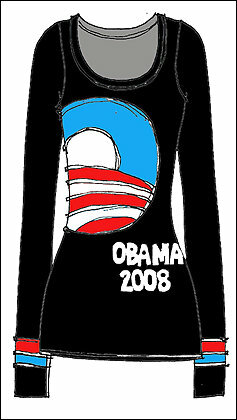 The mix, available online next month, ranges from T-shirts to tote bags and will lend a bit of runway panache to the Obama brand. The list of participating designers, which includes Derek Lam, Isaac Mizrahi, Tracy Reese, Charles Nolan and Diane von Furstenberg, covers the full spectrum of the market, from high-end to inexpensive. Other names have been bandied about but not confirmed: BeyoncÃ©, Russell Simmons, Michael Bastian, Vera Wang.